Hosting a flawless and successful dinner party is much harder than it looks. I'm a firm believer that it is something that takes a lot of practice and most importantly a lot of thought and preparation. I most certainly don't have all the answers as I constantly find more and more things to perfect as I go, but I will share some of the things that I have learned so far. I know it's easy to overlook, but your table sets the tone for the evening. 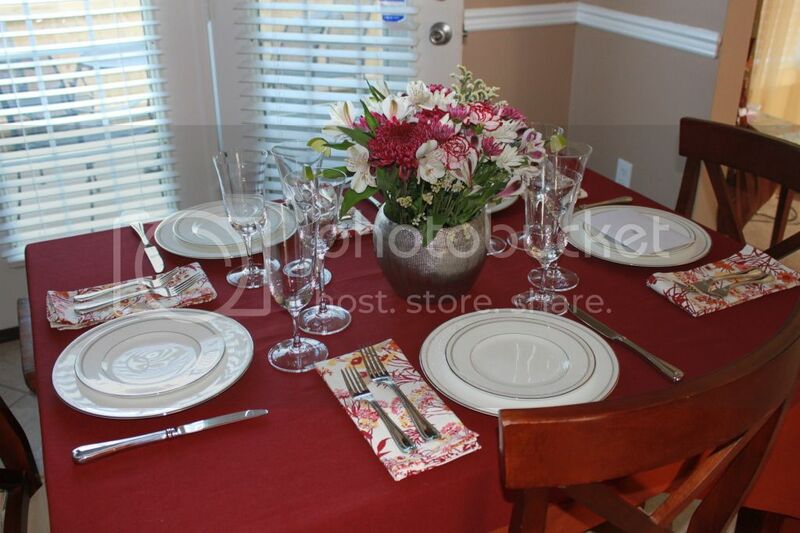 Keep flowers and center pieces low so your guests can talk to each other with ease. No one wants to have to peak around a candle stick or massive table arrangement to see who is sitting opposite of them. People love a good presentation. Let them know you cared enough to do something special whether it's with a beautiful tablescape or an impressive food presentation. If you are throwing a dinner party more than likely you will be investing a lot of time and a good sum of money so be sure to put some thought in it. 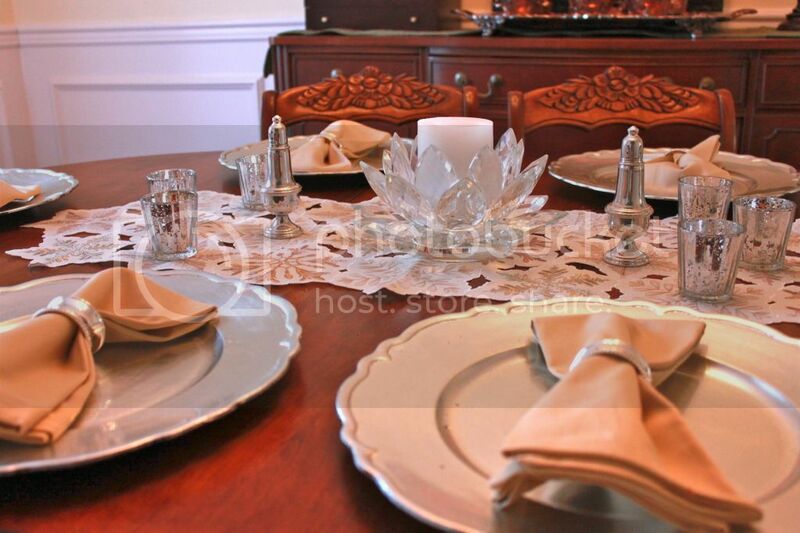 Will your guests seat themselves or will you have place settings? If you are in mixed company (as often families can be) you might want to go ahead and do place settings so everyone can skip that little awkward dance of who might get stuck sitting by who. Here's a tip: Remember you and your husband sit at the head of the table since you are hosting (place yourself closest to the kitchen) and the rest goes boy, girl, boy, girl to keep the whole table talking (this is not the place to divide off into half the table talking about sports and the other half talking about bras). If you have just a few people don't worry about place settings and let things happen naturally. Play music to help avoid awkward silences. Make sure it isn't too loud to be distracting and also make sure it is something appropriate for everyone who will be attending. If we are grilling I don't mind some classic rock, but for a fancy holiday meal I'd probably just stick with the obvious Christmas tunes. Also be sure to turn turn your AC down a couple of hours prior to guests arriving...a hot kitchen and lots of people equals an uncomfortably hot house. My go to menu consists of a meat (or main course item), an intriguing salad (make your own dressing, add a unique ingredient like hearts of palm or a special cheese), two or three sides (preferably one or two you can make ahead), and a fantastic dessert. 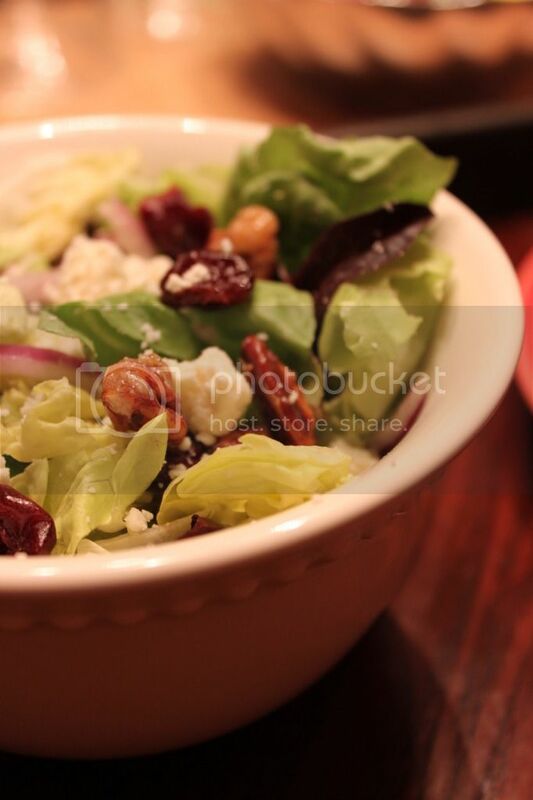 I used craisins, toasted pecans, feta cheese and a homemade dressing here for a weeknight dinner party. I know this is a faux pas but I serve what I like to serve regardless of what I think other people will or won't like. I've found if you love to cook it, people will love to eat it (and if they don't...well...they don't have to come back do they?). Okay maybe ignore that last bit. My point is, don't let the picky eater limit what you cook. That's their problem not yours (or your other guests) just make sure you make at least one thing they will eat. How Will You Pull it Off? A week in advance make sure you know how many people will be coming and decide on your dinner menu. Set your table as far ahead as possible so you aren't worrying with it the day of. Obviously be mindful of fresh flowers and wait until the day of to do those so they are at their freshest. Mother's day 2010 - I gave the centerpiece to the guest of honor! Make a timeline. What dishes can you prepare ahead of time? If you are smart you will have a few of these so your dinner guests don't have to watch you run around like a mad woman all night. How long will each dish take to bake? What will the oven temperature be? You need to be sure you will have enough oven space. I try to do all my chopping, peeling, and prepping ahead of time. The prep work is usually what makes a messy kitchen so I get that out of the way at least the day before the dinner party. It makes cooking so much faster and cleaner when it comes to the day of. Be sure to know exactly when you need to put each item into the oven and when to take it out. I write a list out minute by minute if needed so I can keep up with what's going on. I get very easily distracted once guests arrive so this is a must for me. Ding, Dong. Your Guests are Here! Have your music playing before guests arrive. When they walk in the door make sure you greet them and put the hubby on drink duty. Everyone feels better with a drink in their hand even if it isn't alcoholic. 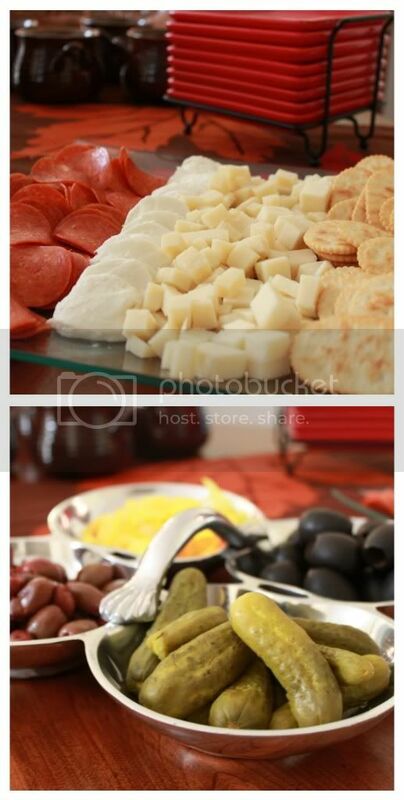 Appetizers are great to offer to a hungry crowd and will keep people from badgering you on when they will get to eat. Have someone get the dinner drink orders so you can have those ready at the table. Once it is time to eat get everyone into the kitchen (if they aren't already in there) and tell them what the game plan is. Will you be serving them at the table? Let them know they have place cards so they don't get confused on where to sit. Will you be doing a buffet? Tell them what you are serving and instruct someone to start the line (preferably someone who won't do the awkward "no you go first" thing). Once dinner is underway, make sure to pay attention to the flow of things and take up plates once everyone is done (don't rush!). Tell everyone to stay where they are at while you get the plates so the conversation flow isn't interrupted. Don't ask if anyone wants dessert, just bring it to them and they will take it. For some reason, I've found if you offer, people tend to feel the need to turn it down which is just outright annoying when you have slaved away at something fabulous. After dessert it done and conversation has ebbed, get everyone to move into the living room and continue on! Your part is done, sit back relax and do the dishes tomorrow! Yay! You are the queen of table settings :) I know how you love your plates. Great tips! Wow! This all sounded amazing... You are a pro. I know who to turn to when i throw one! You are a pro at this! Love it, thanks for the tips!! Wow, this is so impressive! 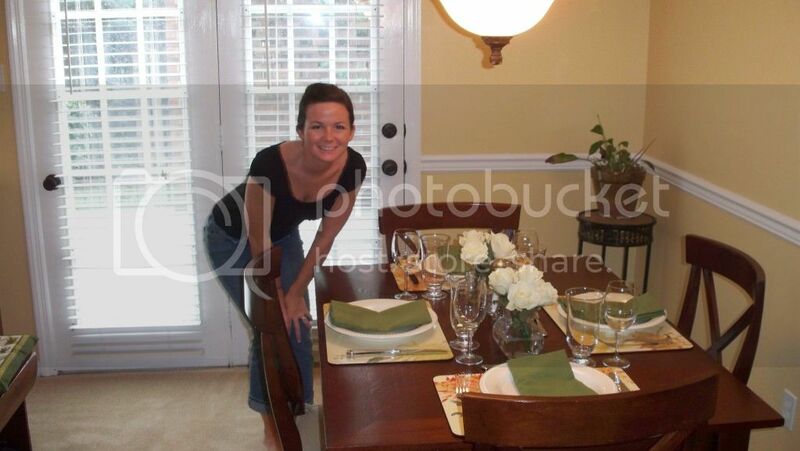 I've always wanted to host a dinner party, but we've never actually had a sit-down dinner for guests at our house! Thanks for the tips! Your pictures are absolutely amazing!! awesome awesome tips!!! I am always the frazzled mess...but have found that having a friend over to watch Addie and do any last minute things so I can get ready (hair, make-up, etc.) has been a HUGE help:) Your table settings and food looks amazing!!! Pretty table! I have the same china I think. Lenox Federal Platinum? Love your tips! I love decorating and hosting parties, too. It's a wee bit stressful for me in the beginning, but when it all comes together it's amazing! And your plates are gorgeous by the way! Great tips! I love the idea of having someone go first that won't say "no, you go first" and not asking about the dessert but, just serving it. wow. i totally want to come to your next party. impressive tips! 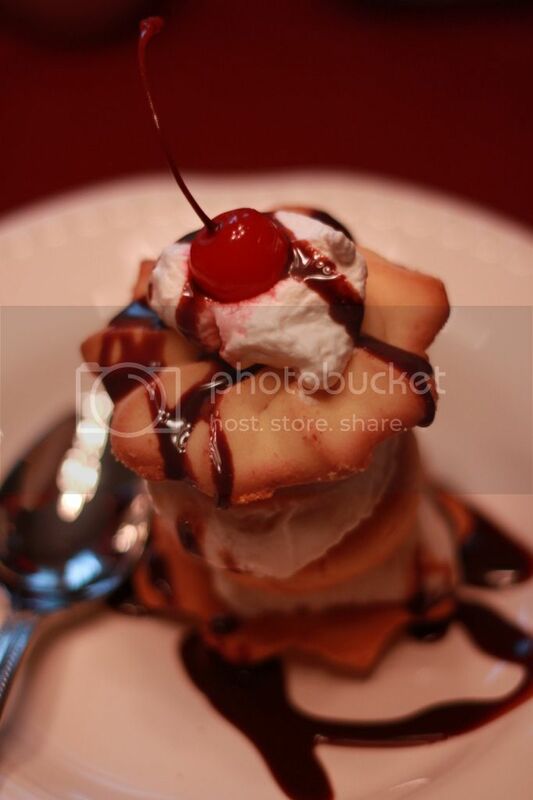 I LOVE the tip of just serve dessert - that's a good one and SO true. If you ask, everyone says no. WTF? I haven't done a big dinner party is a while, but it would be fun to do one again. Great tips! I also love the dessert tip. I never thought about it before, but I'll try it.